The last few months have been most exciting for us, and right now, many products improvements are on their way. 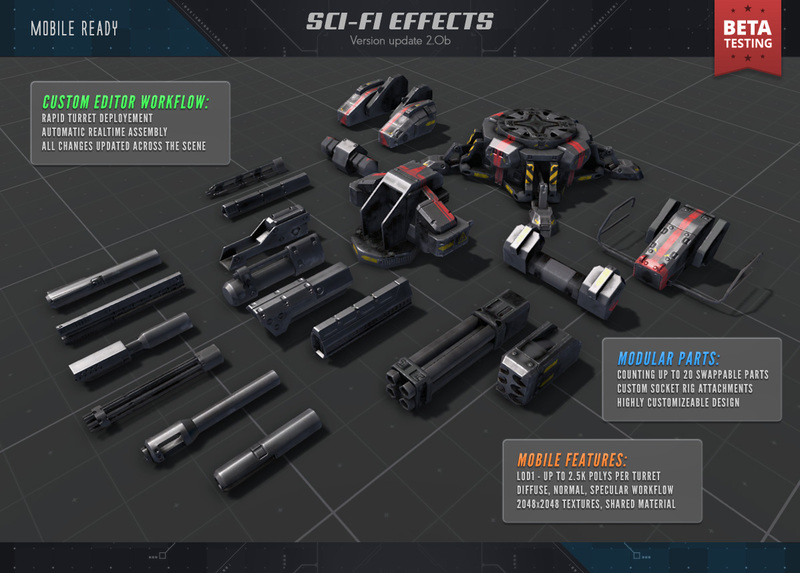 Today, we’re taking a look at the new modular system in Sci-Fi Effects. To kick things off, we’ve added several new elements into play, including new Turrets, the Turret Editor, revamped Tracking Controller and the redesigned Pool Manager. We’re excited to share with you the significant changes occurring this update. 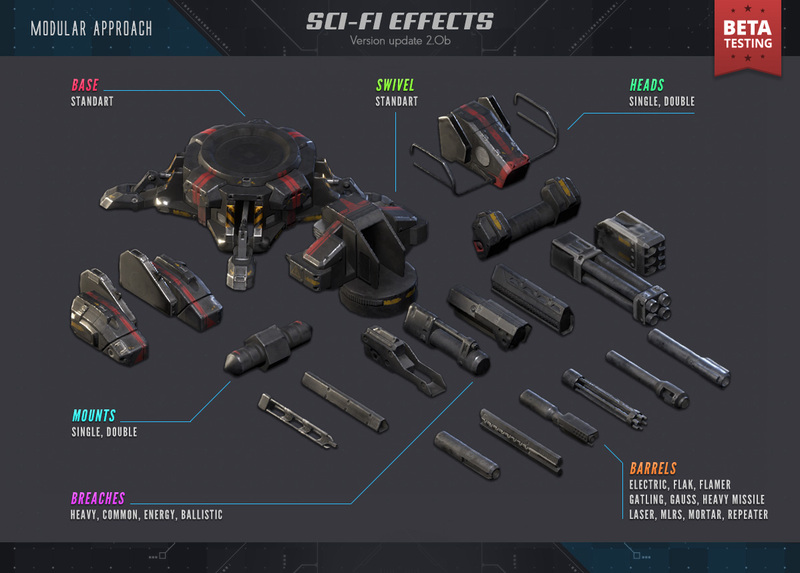 What is Sci-Fi Effects without it? Remember how it’s all started with that turret? That’s right, and we’re happy to fulfill all your requests going down the list! In this update, we are wrapping up high-end and low-end platforms support for Turrets with new shared LOD. The overall workflow is designed to do away from separating the mobile but rather taking care of both as a whole as much as possible. 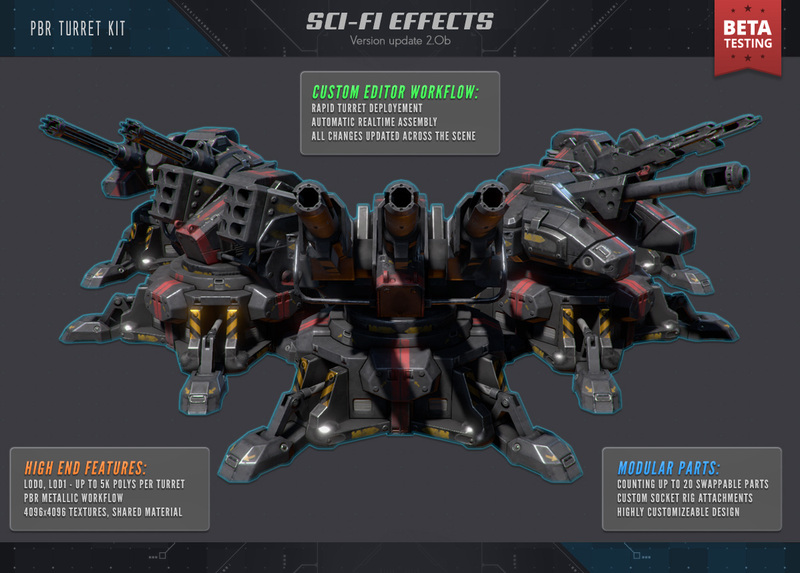 We have made numerous changes to reduce the entire asset difficulty and the amount of time required for turret parts swapping by introducing the modular approach we’ve been working on during the last summer! 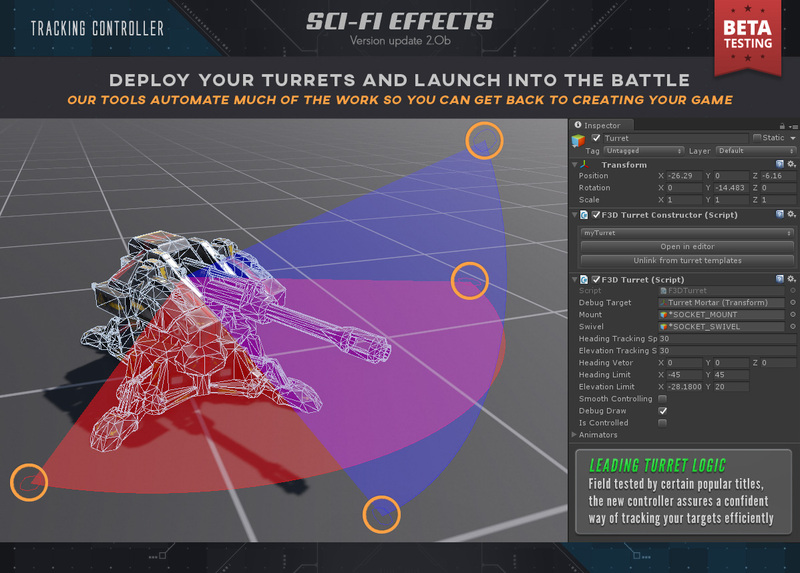 Let’s check out one of the most useful tools on the list: the Turret Editor window. It’s in the Forge3D menu located in the upper center of your screen. It will take you to a new window dedicated to turret assembly and general setup. This is where things start to get interesting. The first and the leftmost column lets you create, manage and keep turret templates, which are shared across the entire project in a ScriptableObject database. Add to a scene – One can create a new turret instance in the scene from a particular template. It will also position new turret transformation regarding the current selection in the hierarchy. Duplicate – One can create a duplicate for any template by selecting an existing template and clicking ‘Duplicate’. Remove – This option deletes a selected template from the database. Please note, removing a template will unlink all the relevant turrets in the scene. Templates – This lists all the Turret templates available in the ScriptableObject database. 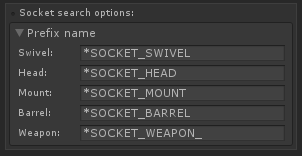 Selecting any item from the list will update the Turret setup column. You can also delete a template by clicking the ‘X’ button next to an element in the list. 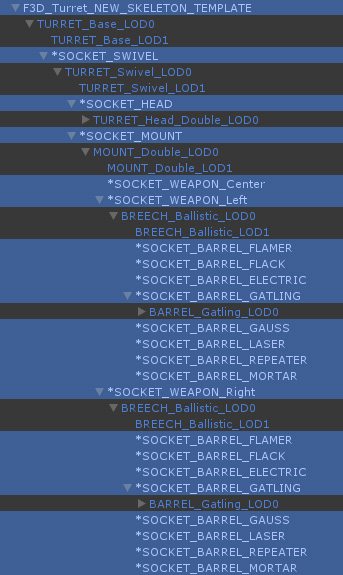 Once the new turret template is confirmed, the editor will pick up all the available parts, and the user can then use them to build the turret. 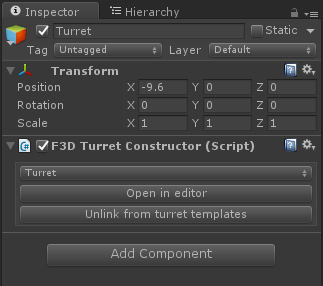 When the user makes a change such as swapping parts or toggling a checkbox, the Turret Constructor component starts the reconstruction process immediately. The general technique is the same for any platform with one exception: the mobile platforms should be limited to LOD1 prefabs only, and the LODGroup checkbox should be disabled. Much of this system happens automatically. And if you’re going to add new parts why not do it in style? From the perspective of the modular asset, the easiest way to take care of dynamic editing of the content was establishing an entirely covered rig with interchangeable parts. With that in mind, we introduced the unified skeleton with a few requirements so that a turret section requires a special socket to plug in. The frame is based on a parent game object with various parts distributed across the turret rack. Depending on a role in the rig, certain parts require a socket in its prefab. The socket defines an attachment point describing how the parts stack together. Further customization is possible by nesting multiple sockets within a prefab. 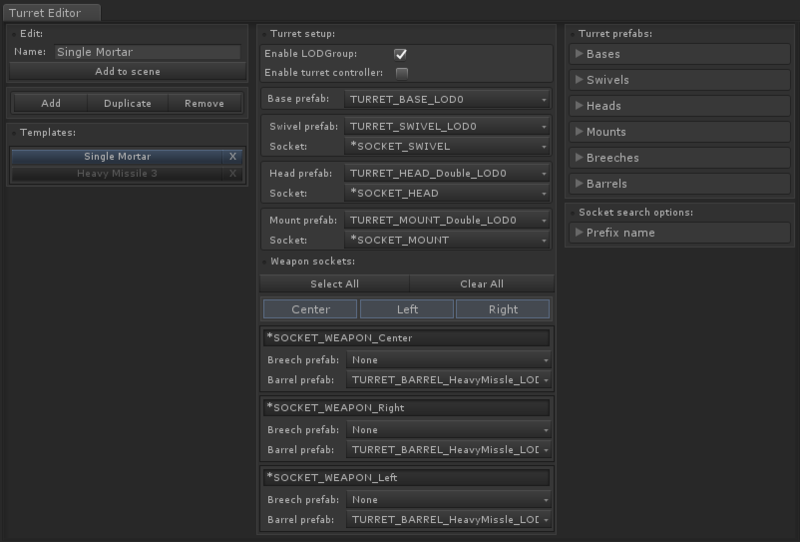 The last rightmost section of the editor is where you can add new turret parts and modify socket names. That’s all it takes. But before we can make anything move, we need to unlink the new turret from the editor. We’re going to select the turret in the scene and check out the Turret Constructor component. One of the greatest thing about Turrets is the ability to sculpt any turret design no matter what type you’re trying to build. In the very same way, we also allowed the automatic parts assembly on a turret skeleton using the utility component. The concept is simple. Turret Constructor ensures a turret is always updated with the latest changes and once the template is confirmed, the parts of the turret skeleton are replaced in the process. The Turret Constructor component is added automatically upon building up a turret. In addition to that, a particular turret can also be toggled between the templates using a popup. The key thing to remember is that a Turret Constructor will overwrite any user changes through a skeleton reconstruction during the editor updates. 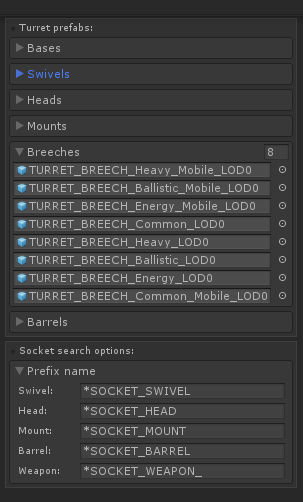 Now that we’ve looked at how to setup a turret from scratch, we’ll now disconnect our instance from the Turret editor to prevent any further changes to its state. You can unlink a turret by clicking ‘Unlink from turret template’ button located at the very bottom of a Turret Constructor. That’s it! When you’re happy with the changes, you can now create a new prefab and toss it into the action! Perfect for any kind games, the redesigned turret controller is now highly customizable including the arc of fire handles and several aiming algorithms. The last item that we’d like to confirm is a redesigned pool manager. The updated version allows you to toggle between a collection of pools and contains a lot of useful innovations such as load balancer, a scriptableObject database and separate settings for each pool. Despawn(Transform obj, Transform objTemplate) – it will significantly increase the despawn productivity. Moreover, the more prefabs, the greater the gain. 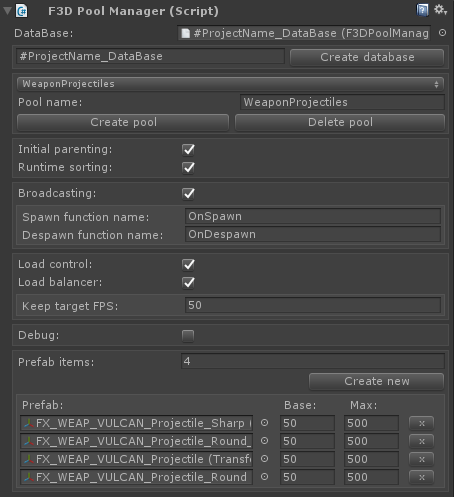 For example, if there were about 300 prefabs, 200 objects each – than a regular despawn would have taken a significant time to skim through all spawned objects. But thanks to the advanced despawn it will only go through the ones of the same type as objTemplate. So, the total gain is getting close to about 300 times faster! Broadcasting – Calls the specified method name for every spawn and despawn event on the certain game object or any of its children. Debug – Shows details about the results of running internal commands. It can be especially useful when a verbose console output is required. Max – The maximum amount of a particular instances allowed in the scene. The pool will ignore any further spawn requests above this value. As we bring you some exciting new developments to the existing framework, we’ll be narrowing the engine support to the latest at the moment of an update release. While our hands are full with various tasks, we’d like to focus on the upcoming features before bringing the extended version support and therefore strict to the Unity Engine version including 5.4.0 and higher. It was a busy schedule to tie up loose ends with rolling new features, working hard, and making new bugs to smash! We’re officially in the beta now, and ready to impress you with the progress covering even more over the course of upcoming updates. Hope this overview gives you a good sense of what this update is all about, and please feel free to contact us with any questions and comments. We look forward to your valuable feedback and suggestions regarding the quality of our products.